You want to put your best face forward. African American skin needs to be maintained properly to look its best. 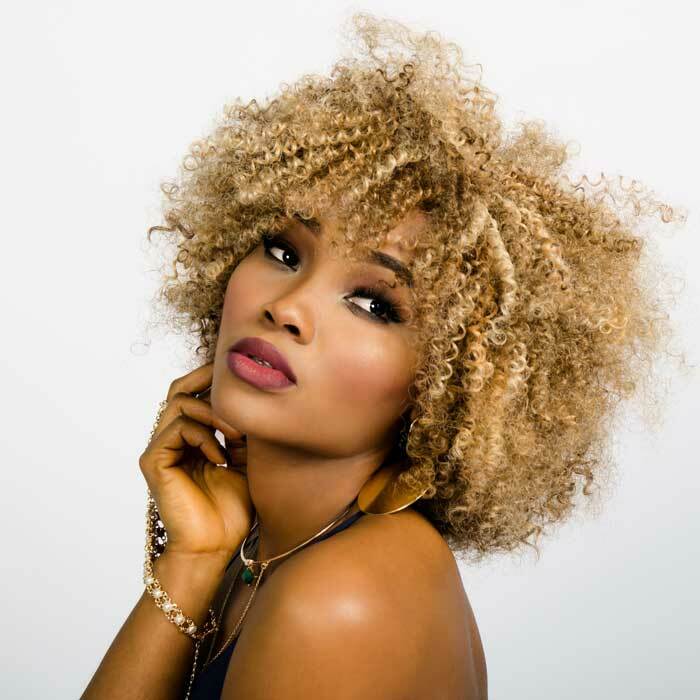 Common problems among African-Americans are hyper-pigmentation (dark spots) caused by scars from acne or other injuries to the skin and "ashy" or gray skin caused by not exfoliating properly. While African-Americans do have the advantage of natural protection from the sun (we've all heard the phrase "Black don't crack. ", that doesn't mean that Black skin care can be taken for granted. Our face care products for African-American are of absolutely the best quality, at a very reasonable price. Because your skin has unique needs, HumiNature has multiple products for “normal” to special needs skin types. We have also assembled recommended “regimens” which are bundles of products that work well in concert with each other. Each regimen is based on completely natural, non-soap cleansers, alcohol free toners and balancing non-greasy, non-comedogenic moisturizers. If you have dry skin, you might have been tempted to skip the toner step because many toners are drying and harsh. Ours are not. Each of our products is gentle, hypoallergenic and helps prevent and/or repair damage. Click on the links below to see a short description of each product or regimen. I have multiple skin conditions I'd like to treat. Is it OK to combine regimens? I have acne (occasional outbreaks). But, I would also like to treat hyperpigmentation (dark spots) left by earlier outbreaks. What products do I buy and how often do I use them? How do I take care of my face? What are the steps? How do I wash my face and how often? Q.) I have multiple skin conditions I’d like to treat? Is it OK to combine regimens? A.) Generally speaking- yes. For example if you have problems with mild to moderate acne you can use a mild cleanser and toner (for example our HumiNature Deep C Cleanser) and follow up with an acne treatment. Or, if you have dark spots from previous blemishes, you can certainly use the fade gel products in combination with other cleansers and toners. But, keep in mind there are certain things you should and should not do. For example, those with acne or sensitive skin should NOT use a facial scrub. You should not combine exfoliating treatments (for example microdermabrasion with a skin peel). Those using fade products should wear a sunscreen (of some sort) during the day. Q.) I have acne (occasional outbreaks). But, I would also like to treat hyper-pigmentation left by earlier outbreaks. What products do I buy and how do I use them? A.) You actually have several choices. Keep in mind the regimens we sell are only suggested combinations of products designed to treat specific conditions. Each person’s skin is different. So, we encourage our customers to work with your skin to develop the regimen that is best suited for you. Here’s how we would suggest building a regimen to treat this type of situation. This is just an example to show how you might go about selecting products. 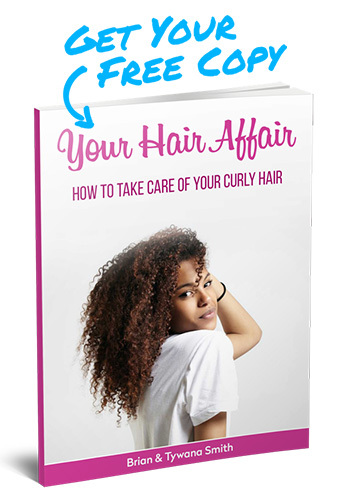 We are not suggesting you need to follow this regimen exactly. Second step is to tone. The toner should be a very mild astringent that tightens up pores. Again, be very gentle with the face while applying. Next you will want to treat any active acne outbreaks. This can be done with one of the Black Opal products (Blemish Target Gel for example). You’ll want to spot treat the dark spots. Using a Fade Gel or Cream (such as HumiNature’s with hydroquinone at night and a fade cream with a sunblock during the day. Lastly, use a moisturizer, if necessary. How do I take care of my face? Moisturize- depending on skin type, replenish moisture. Treat- depending on skin condition and desires- can be a blemish treatment, fade treatment or skin rejuvenation treatment (such as a masque or deep moisturizing créme). Q.) How do I wash my face and how often? Use mild, non-soap cleansers. The cleanser should gently lift dirt and remove excess oil. But, it should not "strip" your skin leaving it dry as a bone. Use harsh, drying soap-based cleansers. People with oily skin or who are acne prone might be tempted to use drying products to "clear up" your skin. The reality is these products often cause more damage. Excessive drying and flaking is not good for your skin. If you have mild-to-moderate acne, it can be controlled with a simple regimen using quality products. Wash regularly- once in the morning and once at night. If you have oily skin, you can add a washing in the evening or after noon. Skip washing your face regularly or wash too often. People with oily skin may be tempted to wash more frequently. Do not wash your face more than three times per day. Scrub your face. If you use an exfoliating scrub, make sure it has gentle, non-jagged particles and apply light pressure. If you use a washcloth, change it often. Bacteria will grow on the washcloth and those bacteria reapplied to the face can lead to breakouts. Just splash your cleanser on your face and immediately rinse off. If you are using a moisturizing cleanser or a cleanser with ingredients to help your face, you want to leave it on long enough to do its job. This is especially important if you have acne prone skin. Pat your face dry with a clean towel Rub your face vigorously. This can damage to your skin and cause outbreaks. For most skin types, wash face in the morning and before retiring. Oily skin types can wash up to three times per day, but no more. Q.) How do I determine my skin type? A.) There are three or four basic skin types. Oily, Balanced or Combination Skin and Dry Skin. The way to tell your skin type is to check your skin a couple of hours after you have washed it. Oily Skin- oily skin will appear smooth and supple most of the time. Oily skin may be susceptible to frequent or occasional acne outbreaks. Oily skin will generally feel smooth to the touch. Balanced or Combination Skin- balanced skin is skin that has the right level of oil present in the skin. Generally balanced skin will feel smooth and supple. Combination skin will have oily spots and/or dry spots. Generally, the oily areas are around the nose and eyes (known as the “T” zone). Dry areas often occur around the mouth. Combination skin might require spot oil treatment (astringents) and dry skin might require spot moisturizers. Dry Skin- dry skin often appears dull and tight and might feel rough to the touch. DMAE is an amazing nutrient that extends the life of cells and inhibits the cross linking of proteins, which gives the skin a tone and firm appearance. Our HumiNature Age-Defying Face Cleanser is an all-natural facial cleanser with DMAE. Our cleanser is great for those concerned with the effects of aging. Acne prone skin is sensitive skin. Many “anti-acne” treatments are so harsh that they actually exacerbate the condition they are supposed to clear up. 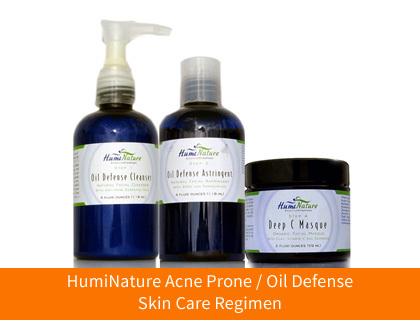 HumiNature Oil Defense Cleanser is natural and mild above all else. Contains activated charcoal, tea tree oil and citrus extracts to control acne breakouts naturally. 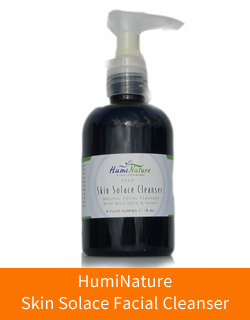 Our all-natural HumiNature Skin Solace Cleanser is a mild and gentle facial cleanser is well suited for those with sensitive skin or who just want to treat their face to a deep, natural cleansing without the use of harsh chemicals. This cleanser will leave your face feeling soft, clean and energized. Honey is a humectant (attracts water). And, the acids in honey gently help promote skin turnover (removal of dead skin). Honey is a gentler way to get benefits similar to the benefits obtained by Alpha Hydroxy Acids. So, it’s great for those with sensitive skin. Wild Oats help skin retain moisture and keep the skin soft. Great for dry or sensitive skin. Our HumiNature Cucumber Mist Natural Facial Toner is an all-natural moisturizing facial toner infused with pure Cucumber Hydrosol (essence). Cucumber has natural anti-inflammatory properties. Aloe Leaf Juice softens. Witch Hazel tones. And, Tea Tree Oil and Black Willow Bark kill germs. This toner is perfect for anyone with a face. Our HumiNature Skin Firming Toner with DMAE is our finest quality toner. DMAE is a natural nutrient that extends the life of cells and gives the skin a tone and firm appearance. DMAE temporarily causes a slight tightening of the skin, which reduces the appearance of fine lines and wrinkles. Naturally astringent, skin balancing and acne fighting, our HumiNature Oil Defense Astringent does it all. Alpha Hydroxy Acids gently exfoliate while fruit acids balance your skin tone. Black Willowbark provides naturally occurring salicylic acid to fight the causes of acne. Our astringent does the job without stripping your skin and causing excessively dry skin. DMAE gives your skin a tight and polished appearance while the essential oils get to the root of acne. HumiNature AvoJoba Face Moisturizing Crème is perfect for dry to combination skin types. Made with the finest natural Jojoba, our crème restores a proper balance to skin. Technically, Jojoba is not an oil but a wax. Because it is the closest thing in nature to the body’s own natural sebum, Jojoba removes excess oil from oily skin and provides additional oil to dry skin. This allows Jojoba to restore restoring the skin’s optimum oil balance to skin that is either too dry or too oily. Avocado oil is well known as an anti-aging oil. HumiNature East African Shea Butter is the crème de la crème of Shea Butters. Because it is extracted manually from the highest quality shea nuts of the Nilotica variety, East African Shea Butter is softer and more fragrant than shea butter of West African origin. East African Shea Butter is naturally high in shea olein, melting more gently into the skin. HumiNature Anti-Aging AntiOxidant Crème is a super-premium age fighting crème, loaded with anti-aging agents. You will not find a better anti-aging crème, at any price. The natural moisturizers and vitamins rejuvenate your skin and reduce the appearance of wrinkles. Avocado Oil is well known as a natural age fighter and this crème is packed with it. The crème is also armed with vitamins A, B, C, and E to wage war on the effects of aging. HumiNature Shea Butter Facial Crèmeis perfect for all skin types. Our premium Shea Butter crème is thick and loaded with Shea Butter, Jojoba Oil, Vitamins and other nutrients that your skin will simply drink up. The normal daily regimen is essential for maintaining good skin. But, for that extra boost we all need, especially as we age, we offer these pick-me-ups for your face. HumiNature Deep C Masque is a luscious and effective facial masque. Montmorillonite (French Green Clay), Vitamin C Esters and Seaweed Extract make this an incredibly luscious and smooth clay mask. The Vitamin C Esters absorb readily into the skin. We use them at high enough concentrations to be effective. However, we keep the level low enough so that the masque does not sting your skin. HumiNature Papaya & Clay Skin Peelis a gentle skin peel with fruit extracts and kaolin clay. Leaves skin looking bright and refreshed. Eliminates ashiness. Skin peels are becoming very popular among the baby boom generation. This is a safe, effective way to recapture or retain that youthful glow. HumiNature Rhassoul Clay is an excellent mask for the face and body and a great deep cleanser for hair. Used in the finest spas. HumiNature Skin Polish Crème (Microdermabrasion Cream) is a natural way to remove the harmful effects of aging, brighten skin, remove fine lines and hyperpigmentation, all in the comfort of your home and at a fraction of what you would pay for treatments in a spa or doctor's office. Our regimens are based on a 4 Step System. The fourth step is optional. Step 4: Rejuvenate, Treat or Restore- evening or occasionally, as needed. The Ajuvén Face Rescue Kit is especially for men's skin care. Gentle yet effective products designed and packaged for men. The HumiNature Sensitive Skin Care Regimen is gentle and effective, at the same time. The HumiNature Sensitive Skin Care Regimen contains hypoallergenic products that are mild and will not cause irritation to those with sensitive skin. No added colors or fragrances are used in these products. Sensitive skin should definitely NOT use soap-based cleanser or harsh toners as are found in many over-the-counter products. Effective, all natural, non-soap cleansers with specially chosen anti-acne essential oils, an acne fighting toner and a non-comedogenic masque make our HumiNature Oil Defense Skin Care Regimen. Many anti-acne products cause excessive drying and irritation to the skin which can actually make acne outbreaks worse and leave your skin irritated, dry and flaky. Our regimen fights the acne without damaging your skin. We include a clay masque to use one to three times per week for deep cleaning to help prevent blackheads and pimples from forming. Since our cleansers and toners are non-drying, will probably find that you do not need a moisturizer on a daily basis.